Standing loud and proud in the centre of Place Charles de Gaulle since 1836, the Arc de Triomphe is one of the French capital’s most iconic monuments. Napoleon commissioned its construction back in 1806. He wanted somewhere to commemorate the victories of his armies, in the style of the Roman Empire. In the heart of Paris, the Arc de Triomphe is easy to reach. If travelling by Métro de Paris, get off at the Charles-de-Gaulle-Etoille stop on lines 1, 2, and 6. You’ll need to disembark at the same station, if using RER’s similarly underground Line A. You can visit the Arc de Triomphe every day of the week from 10.00am to 10:30pm, except for the 1st September when it stays open until 11:00pm. Bear in mind, however, that last admissions to the Arc are 45 minutes before closing time. 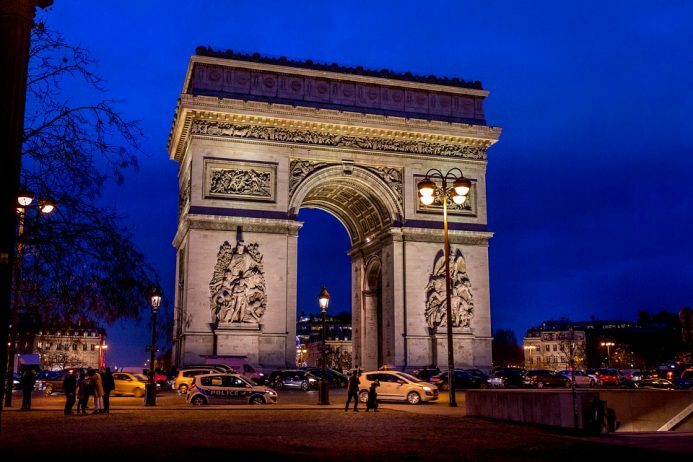 The Arc de Triomphe is shut to the public on the 1st January, 1st May, the morning of 8th May, 14th July, 11th November (am), and the 25th December. If you plan on making it to the top of the Arc de Triomphe, allow 45 minutes to take in the view from below and the top. You’ll need to walk up the 246 steps of a covered spiral staircase. There’s a lift for disabled visitors to use. Most people take the self-guided tour option with leaflets available in Dutch, English, French, German, Italian, Japanese, Russian, and Spanish. If you want a guided tour, you’ll have to book this in advance. These last 90 minutes and are led by English, French, and Spanish speakers. There’s a gift shop where you can pick up books and other mementos. Dress conservatively as this is a war memorial. Look out for a flame of remembrance which is ceremonially lit each day. Located on a roundabout which you shouldn’t try to cross at street level, head up to see the picturesque avenues with pretty paving stones coloured to reveal a star shape. There’s less of a queue the later you go. So, if you want a quieter visit, opt for an evening one. The standard price for an adult tickets is €12, although there’s a reduced fee of €9 for those aged 18-25 who are not from a EU country as well as for foreign teachers and tourism professionals. Under 18s, the unemployed, and the disabled can enter for free. Prices are correct at the time of going to press.